All the information we have about dolphins is thanks to the countless studies, tests, and research that some scientists have performed. In fact, new reports, papers, and conclusions come out every year that mentions the outcome of a given study that expands the understanding of the complex world of dolphins. These mammals were known in the ancient classical civilizations and in others that had contact with the sea. Today it is assumed that they were attracted to this beautiful, docile and almost friendly animal as much as we do. The seventeenth century brought a new era of individuals interested in the life of plants and animals, and from then on began a period of more thorough research performed under an organized structure and later with the scientific methodology. The knowledge about dolphins got during centuries was transferred hand to hand among the famous naturalists. Many species of dolphins were discovered and described for the first time during the nineteenth century, such as the Peale’s dolphin (Lagenorhynchus australis), the White-beaked dolphin (Lagenorhynchus albirostris), Hector’s dolphin (Cephalorhynchus hectori) and the Long-beaked common dolphin (Delphinus capensis). According to estimations, 130 dolphins are in possession of the US Navy. The scientists in the twentieth century discovered new species, and as they got new information, they restructured some taxonomies. With time, investigators sometimes realized that a subspecies existed not previously considered as such or that newly-known characteristics were inconsistent with the assigned taxonomic family of a species. Further research also made them aware of the intelligence potential of these cetaceans. In this regard, the US Navy has developed leading research programs since the 1950s. The most obvious example is the Marine Mammal Research Program (1960), whose objective was to learn about the sense of echolocation and to know the morphology of these mammals thoroughly, with the intention to get the knowledge from them and apply it to technologies at the service of humans. Dolphin research is still relevant for the Navy. To get an idea, in 2007 they spent about $ 14 million on marine mammal research that includes training activities. The number of dolphins in possession of the US Navy is estimated to be 130. But other governmental and non-governmental organizations have carried out remarkable studies in the field and even collaborated with each other. Many research institutes have different approaches, some move from theory to action, implementing rescue or conservation programs. – Genetic data of dolphins. – Brain, intelligence, and communication. – Discovery of new species. – The impact of anthropogenic activities on the species. Research involves a series of studies that include practical activities, which require a highly coordinated team. It includes reviewing previous studies, analyzing findings, and even rearranging information, which sometimes leads to changes in the taxonomy of some species of dolphins. Today we have a lot of information about dolphins since they are one of the most studied animals probably because their intelligence and some similar characteristics to humans make them grab the focus. US researchers led by Dr. Jason Bruck of the University of Chicago stated in 2013 that dolphins have the longest social memory of all non-human beings. They can remember individuals even after 20 years since their last interaction and in the opinion of these scientists, this is the result of the close social relations established between them. Although it was an issue that was already suspected, researchers from the University of Saint Andrews in Scotland, brought to light in 2013 a study that proves once again that each dolphin differentiates from the others by emitting a characteristic whistle. In human words, a kind of a particular name. According to Dr. Vincent Janik, dolphins responded to their “name” during the tests when the researchers made their whistling sound through underwater speakers. A study by the Dolphin Research Center in Grass Keys, Florida, released in 2013, reported that dolphins could solve problems in the same way humans do because they can make decisions and guess. They not only react to stimuli. Dolphins have culture; an aspect believed to be exclusive to man. Observations concluded this when seeing bottlenose dolphins (Tursiops truncatus) using marine sponges in their snout to protect it by feeding on rough surface areas. Subsequently, the researchers realized that mothers transmitted this behavior to their offspring and they learned in consequence. The former is a great discovery because transferring knowledge among generations is probably one of the main things that made humans reach the fantastic development that we have now. Therefore, even in a basic way, demonstrating this behavior put dolphins in a whole new level. Research is ongoing. There is still much to discover despite being activities that involve a lot of time, work, and money. However, understanding their life can generate human awareness and improve conservation efforts. 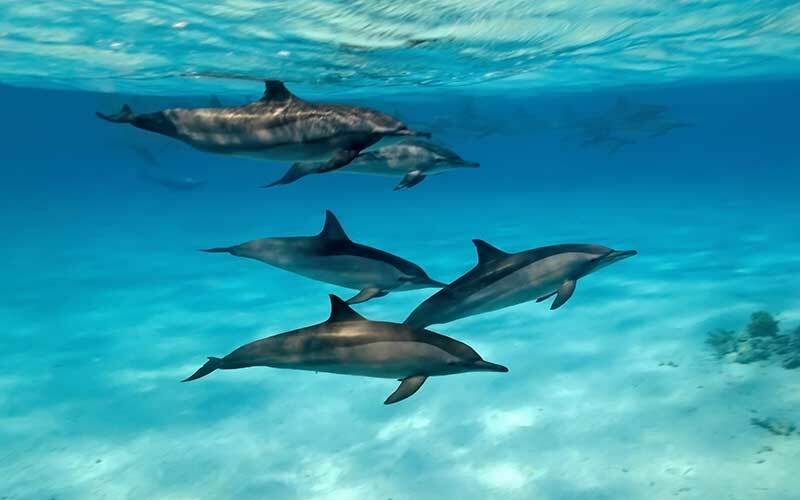 Although we’ve been fascinated by dolphins for thousands of years, it wasn’t until approximately the 1940’s that research in the field of marine mammals began. While there are hundreds, perhaps thousands of research projects currently being conducted on dolphins, the largest project is the one undertaken by the U.S. Navy. The U.S. Navy Marine Mammal Research Program started to work with dolphins in the late 1950’s to analyze their hydrodynamic properties and their biosonar. The hope was that dolphins could be trained to locate and retrieve lost objects from the ocean using their capabilities. In the early 1960’s, John Ci. Lilly and several other scientists discovered that dolphins possessed an intelligence level they believed was second only to that of man and that dolphins could learn how to complete tasks quickly and efficiently. It was at this point that the Navy launched a secret research program on dolphins. Over the next 29 years, the U.S. Navy officially had over 240 dolphins in their research program. The types of dolphins included were Atlantic Bottlenose and Pacific white-beaked dolphins and Beluga, Killer and Pilot whales. For over four years, from 1965 to 1969, the Navy used acoustic signals to give commands to the cetaceans in exchange for fish. The Dolphins soon learned to retrieve mines even more efficiently than Navy scuba divers. In a “top secret operation,” Six Pacific Bottlenose Dolphins were airlifted by the Navy to the Persian Gulf in 1987 where they were used to detect missiles and mines as well as for underwater surveillance. In 1988, trainers who had been working with these dolphins on the Navy project came forward with claims of abuse and carelessness of the dolphins in the Navy’s programs, but despite these allegations, the Navy Research Program continued. Since that time, the Navy has admitted that the Dolphins were also present in the Vietnam and the Persian Gulf War. The Navy employs the Marine Mammal Productions Inc. to catch and transport the animals. They are sent to Seaco Inc. in San Diego, California for their initial training and then deployed to bases in Hawaii, San Diego, and Key West. The number of dolphins currently involved in the Navy programs is at least 130. Thomas I. White. In Defense of Dolphins: The New Moral Frontier. John Wiley & Sons, 2009. Judith Janda Presnall. In Defense of Dolphins: The New Moral Frontier. Learning Island.